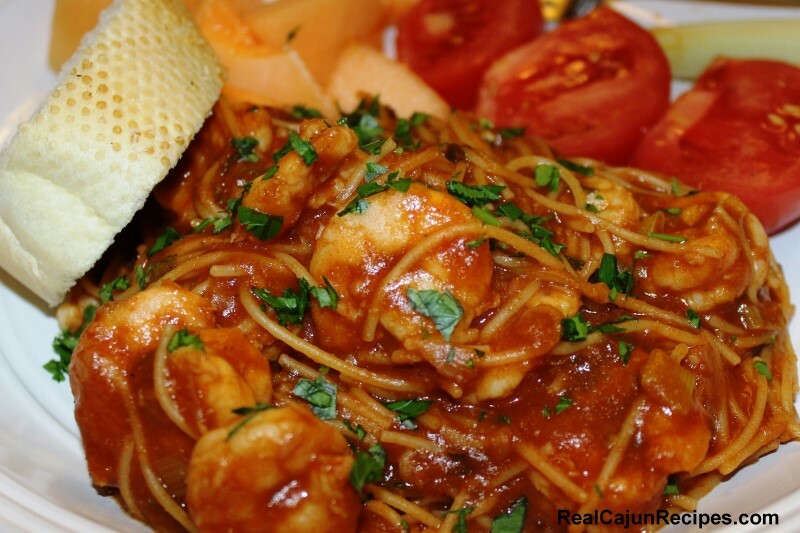 The unique flavor of this dish develops when the spaghetti is cooked in the pot with the tomato and roux based sauce. Spaghetti is the choice pasta but the dish may be prepared with a pasta of your choice. Combine the onion, bell pepper and celery and divide in half. In a 4.5 quart roaster size, add the 1/4 cup oil, the two cans tomato sauce and one of the half mixture of the onion, bell pepper, celery. Cook over low fire, stirring occasionally, while you make the roux.. In a separate pot, make a roux. When the roux is a dark brown color, add the remaining half of the onion bell pepper, celery and garlic; sauté for 10 minutes until vegetables are soften. Add the tomato paste to the roux and sauté for an additional 15 minute; stirring frequently to prevent sticking. Combine the roux mixture with the tomato sauce adding one cup water. Bring to a low boil for 10 minutes. Add two cups water, then add the shrimp adding the pasta loosely separating the stands of spaghetti. Add more water if you prefer a more soupy sauce. Reduce the heat, stir lightly and cover tightly. Check after 5 minutes, stir and add more water if needed. Cook for another five minutes.